What’s Included in the Usage Report? The Usage Report provides a breakdown of all your past bandwidth and storage usage information. 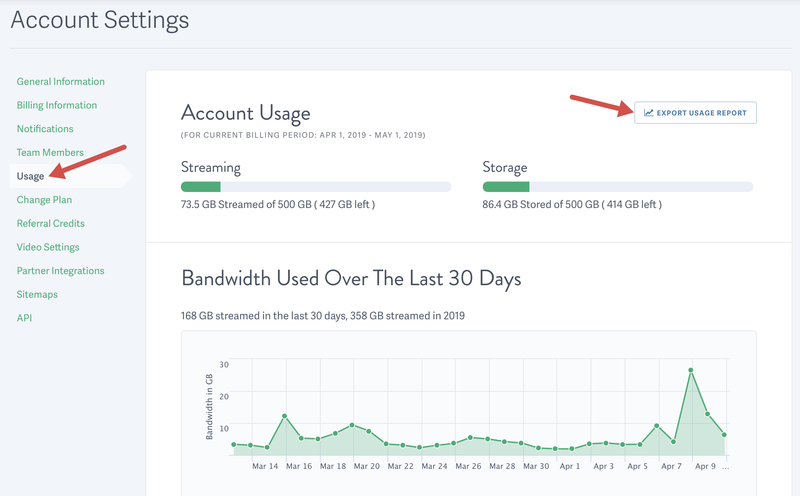 You can review every billing period since your SproutVideo account was opened, and how much storage and bandwidth you used during each period. This can help you predict your future usage, and determine whether your usage is seasonal. This data will be compiled and included in the exported CSV file. First, move your mouse over the person icon in the top right of the page, and select ‘Account Settings,’ then select ‘Usage’ on the left side of your screen. Click the ‘Export Usage Report’ button. Once the report is compiled, you’ll receive an email containing a link to download your report. Once the link is clicked, a browser window will open, and the download will start automatically.